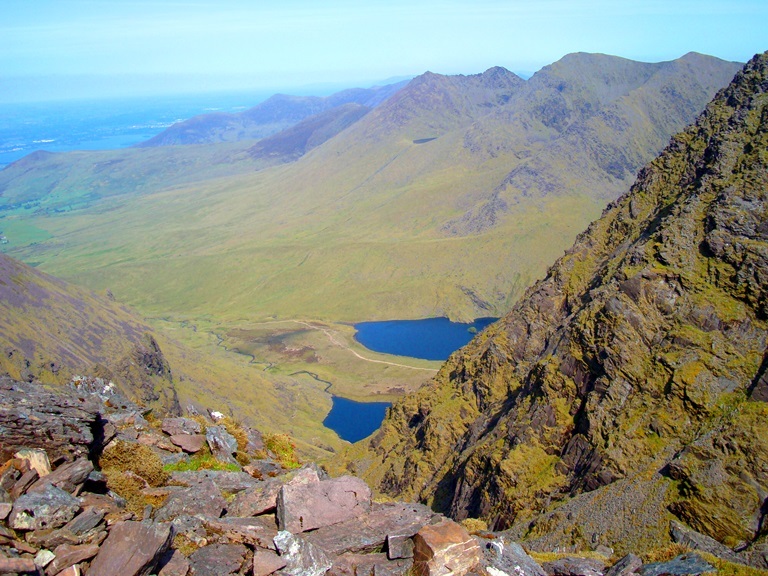 Carrauntoohill is Ireland’s highest peak, positioned in the middle of the ring of Kerry in south west Ireland. This playground of mountains has a challenge for all mountaineers. Standing at 1,039m/ 3,409 ft tall, it is the central peak of the beautiful Macgillycuddy Reeks Mountain Range. Carrauntoohill is a serious mountain and not to be under estimated. 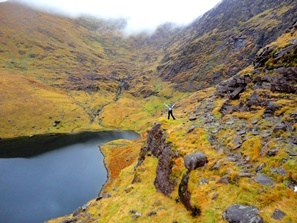 Carrauntoohill’s steep terrain present a challenge to all hikers and climbers, with so many routes you will not be disappointed. This inspiring peak has some of Ireland’s best scenery even on a bad weather day. 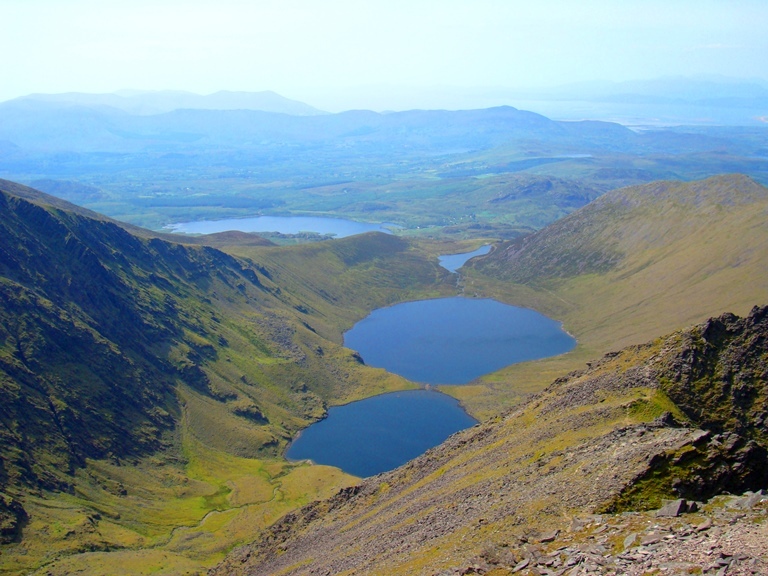 We look forward to showing you all of what Ireland’s highest peak has to offer. Upcoming trips. 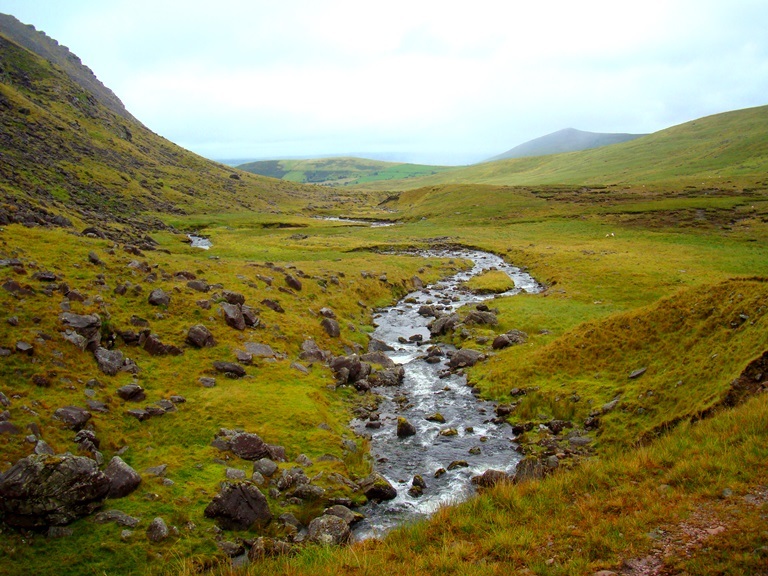 There are two other peaks in this range higher than 1,000m/ 3,281ft Beenkeragh 1,010m/ 3,314 ft and Caher 1,001m/ 3,284 ft. 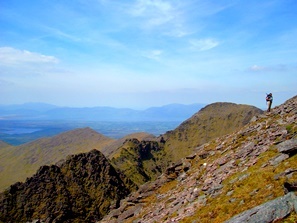 The peak of Carrauntoohill is topped by a large metal cross 5 metres (16 ft) tall. We climb using many different routes, the route will depend on weather and conditions on the mountain. 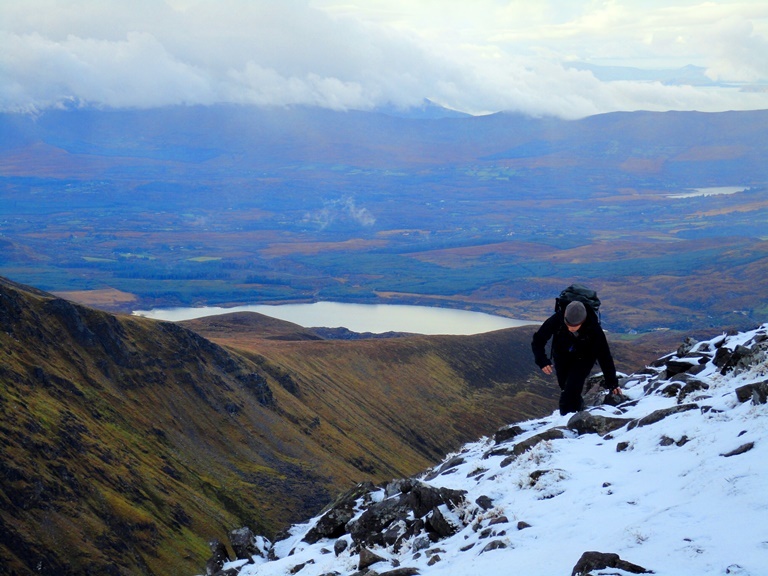 Carrauntoohill is a challenging winter climb and if you can get to Carrauntoohill on a clear day, there is nowhere else you will want to be. 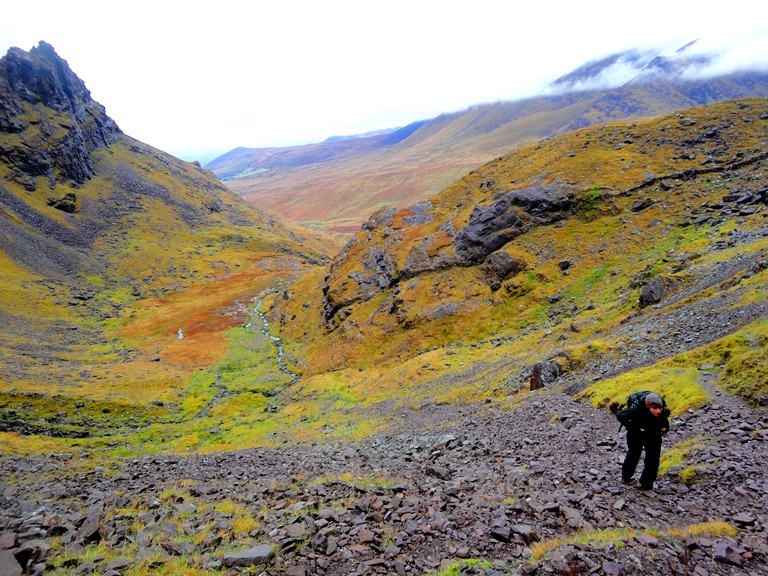 Most of our treks head through the Hags Glen towards two lakes where head right toward the western side of the mountain and the long ascent up to the summit via O’Shea’s gully, this is our favorite route with spectacular views and nice scrambling on route. The Devils ladder route has become more dangerous in recent years due to loose stones and over crowding. No special equipment is needed to climb the mountain, but caution is advised and we highly recommend hiring a guide. Alternatively, we can walk the two other 1,000m/ 3,281 ft peaks in a “horseshoe” trip, starting from the west. 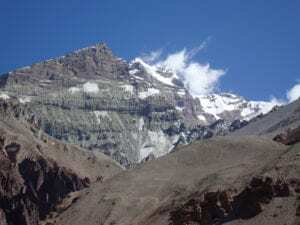 The traverse from highest point to the second highest involves a little scrambling but adds to the challenge of climbing in this spectacular mountain region. We have highly qualified mountain rescue guides available at your service to lead you up and down safely and show you this amazing mountain from all sides. 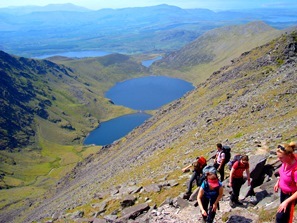 Join one of our groups climbing Carrauntoohill each and every month of the year. Does this information excite you to take on our Carrauntoohill climb? If so, get in touch today. We pride ourselves on making sure that our clients have every opportunity to succeed on the mountains, including professional training advice, gear lists and video links on how to pack your bag, and much more. We are always available to answer any questions you may have by email, phone or skype, so contact us today!